For over a decade, Christian History Institute (CHI) and The Voice of the Martyrs (VOM), an organization that helps persecuted Christians around the world, have cooperated in developing the Torchlighters series of DVDs—short, animated videos that introduce children to heroes of the Christian faith. The series has raised modern viewers’ awareness not only of inspiring Christians from the past but of the fact, sometimes invisible to Western Christians, that believing in Christ often means suffering for his sake. 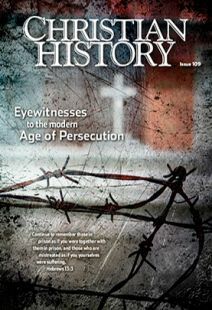 Christian History has previously published an issue (#27) on persecution in the early church. We in the West are well aware of how Christians suffered for their beliefs in those days—Peter crucified upside down, Polycarp burned at the stake, Perpetua thrown into the ring with wild animals. And we may even know stories from dark centuries when Christians fought with and oppressed each other, stories that other issues of Christian History have discussed through the years. Recently CHI and VOM decided to cooperate in telling more modern stories of persecuted Christians around the globe, from the “century of missions” (beginning around 1800) to the present. We do not always realize how ancient stories of Christian suffering resonate with the lived experiences of many modern Christians in countries ranging from Nigeria to China to Germany to Peru. And by “modern” is meant, in some cases, stories as recent as last week. This means that what you will read in this issue is, in part, history that is still being written. As always, we offer thoughtful historical reflections on larger issues and broader trends. But we also include primary sources from people living, ministering, and suffering in sensitive and restricted areas of the world. Where you might in another issue have read excerpts from a diary by a second-century Spanish nun or a frontier Methodist preacher and listened to historians speculate on what happened at the Council of Nicaea or how Bach’s music displayed his Christian faith, in this issue you will also read from newsletters published yesterday and listen to testimonies of suffering under laws passed last month.